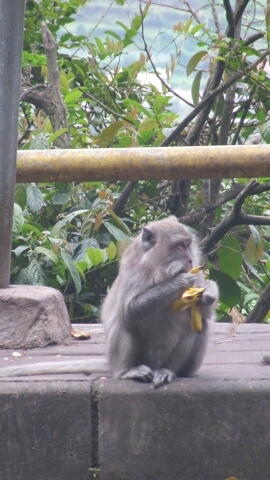 A questionable Do-it-Yourself Tour of Bali – Where's Walton? Precilla was our rental car for the day to explore North West Bali around Ubud. 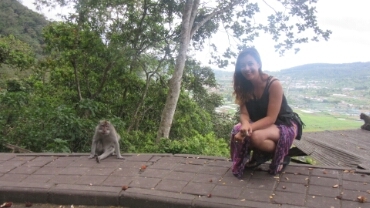 All day tours around Bali start from 180,000 to 350,000 person and that’s just the cost of the driver and car, not including extrance fees. So a 200,000 car plus 160,000 fuel and a free map sounded much more fun and cost effective for 4 people and a bit more of a challenge to find places ourselves and to change the route as we saw fit. We actually still had an authentic Indonesian driver because Steven drives like the locals… like a absolute nutter!! I can’t count the amount of hand-over-mouth near misses overtaking and weaving out of cars and bikes. I had the peace of mind of wearing a seat belt whereas poor Gill did not have a socket. It’s safe to say there were a lot of hail mary’s in the back seat of Precilla. Our first stop was Kunung Kawi also known as the water temples, the drive took less than an hour from Ubud and it was really nice to just look at the window at the views of Bali. 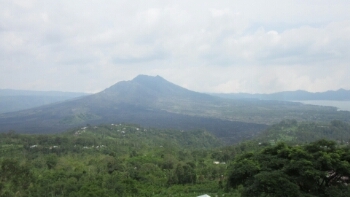 The roads around Bali are very narrow and the two extremes, nicely tarmacked or very bumpy with holes in the road. 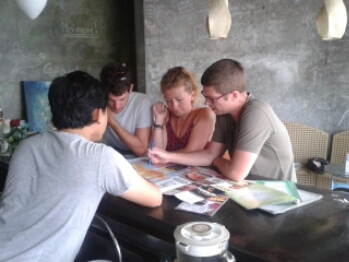 We were quite suprised at how under-developed the roads were considering how Touristy Bali is. 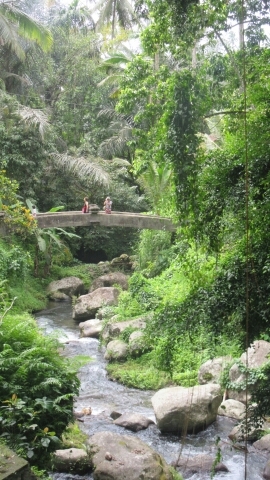 Ubud has been getting tourists since the start of the 20th century however the island of Lombok, which is less touristy, at least has duel carriage ways. Perhaps it’s something to do with land preservation but it sure is hard to drive around in my opinion. There was a moment when I looked out at the tarmacked roads and thought I was back home driving on the way to Buckingham, then I looked to the right saw palm trees and rice fields and remembered how very far from home I am. To get to where we needed to go today we also had to go over the mountains, the roads again are so narrow and in our car I didn’t think we were going to make some of the steep hills! First gear all the way at points…Precilla was not the best car. 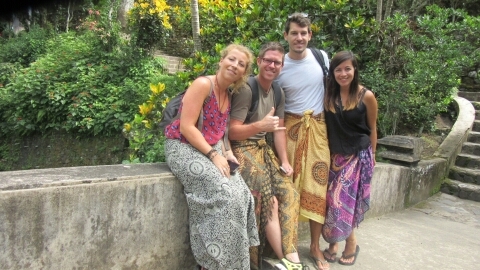 All of us had to purchase sarongs on the walk from the car from the car to Water Temples as we were not appropriately dressed (tut! Westerners!) 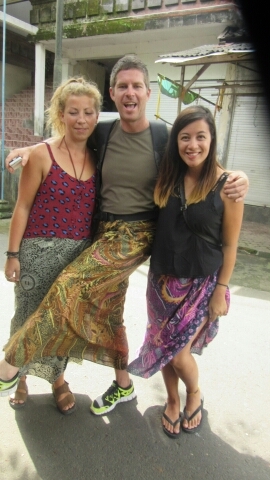 But for 20,000 (£1) a sarong it’s not a big expense although Steven did pull ANOTHER strop and walked off after buying one. But if you do go it’s recommended to wear clothing that covers your knees. 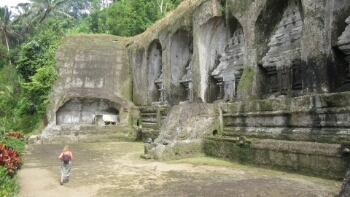 It costs 15,000 rupiah extrance fee to the temples. It’s a small walk around but beautiful views and you can put your hands in holy water. The next 2 hours were spent getting side tracked/lost circulating the lake… we wanted to check out the hot springs but at a steep 150,000 rupiah per person we just continued to drive on until we realised the locals started to look surprises and slightly unhappy to see four foreigners driving through their village… where are we? The locals advised we drove back to which all of us *sighed* in despair. The roads were not good… very hilly, holey and narrow. 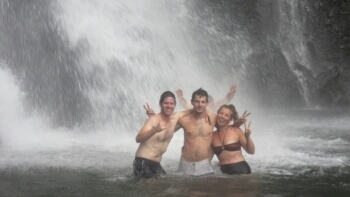 We decided to head north… to either see the waterfall GitGit or another hot springs for a mere 10,000. 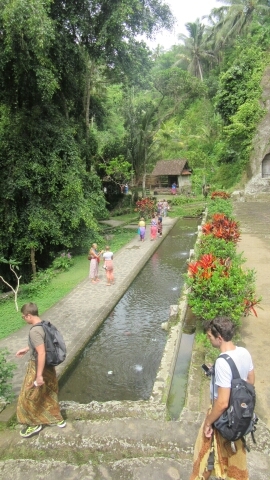 GitGit Waterfall won and was a two hour drive but we saw so much of Bali on the way. 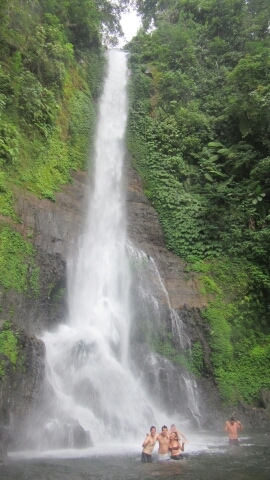 At 40 metres high the waterfall is breathtaking. It only cost 5,000 to see and the guys had a nice swim. I stupidly forgot my swimming gear. 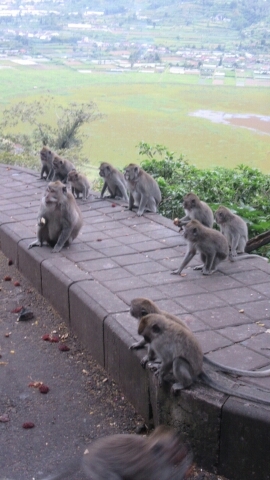 We also found a group of monkeys at the side of the road on the drive home! – We almost killed a puppy that ran out and stopped in the road. – We almost very nearly collided with a big yellow lorry coming the opposite way because we were overtaking a scooter on a bend. – Almost hit the lady on a scooter when attempting to dodge a lorry. I lost it at this point. I wasn’t sure if I was crying because of laughter or shock. 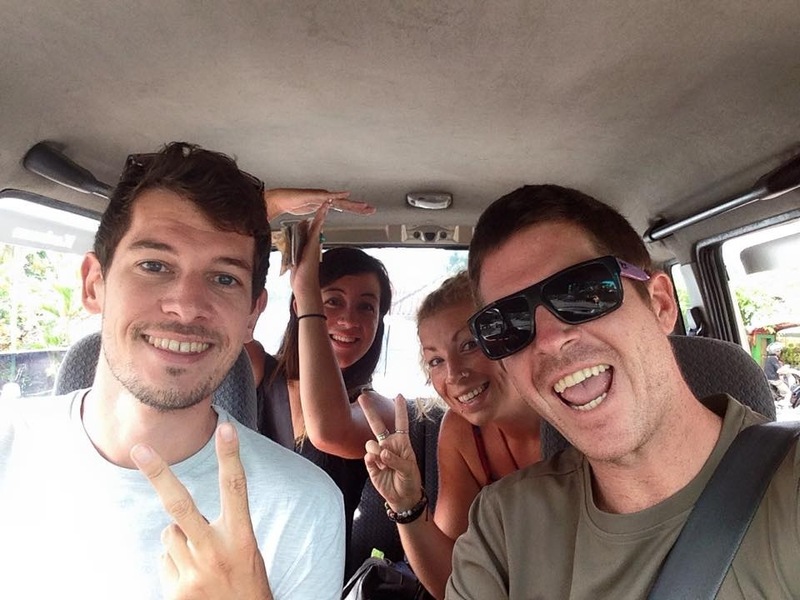 So we thought Steven was a crazy driver… then Pablo got behind the wheel on our ride back to Ubud. Pablo lives in the mountains of Switzerland so he’s used to hill driving so we felt a lot safer… initially. – We hit/clipped a man with our wing mirror as he attempted to let us pass whilst leaning on his car… he was ok. But he did cry out a big yelp. Poor poor man!!! We are so sorry. We were more than happy to invite Steven back into the drivers seat at this point. There were no more incidents following that until we pulled into the street of our car rental place our car broke down on the busy one way street. So the last 10 minutes of our evening was spent pushing the car whilst a huge queue of bikes and cars gathered behind us and all the busy cafés and restaurants looked out onto us. 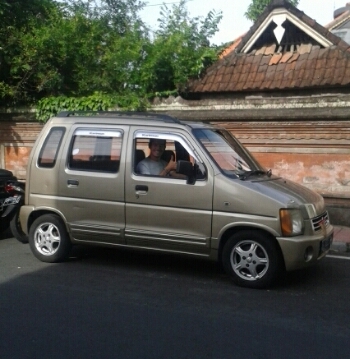 It was hilarious especially when we started offering tourists and Indonesians a taxi ride in our state of the art car. We had no takers surprisingly! I’m so glad we hired a car that day, it was eventful and kept us all on our toes the whole day. We made a sweet little disfunctional family. Pablo had us all laughing the whole day with his layed back attitude and spanish charm with the locals! Gill had the mother and tour guide role talking to Steven about his driving skills and armed with the Lonely Planet book on Bali on her Kindle gave us some interesting facts on Bali. Steven and I just argued as per usual so I guess we took on our standard brother and sister role. That evening was our last with Gill and Pablo. 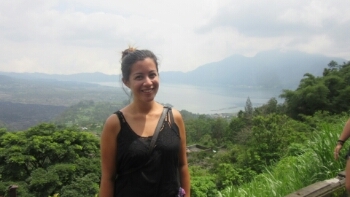 Gill is off to Gili Air for a week at a yoga retreat (I’m so jealous!!) And Pablo is off home to Switzerland where he works as a University Lecturer. One: A positive trait about another person. Two: A weakness you recognise about yourself. Three: The proudest thing you did in 2014. Four: Something you want to achieve in 2015.